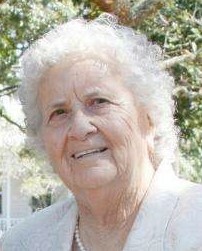 Mildred Buntin Henson, 93, of Phenix City, AL entered fully into the presence of the Lord on Tuesday, April 9, 2019. Mildred was born on November 21, 1925 in Clio, AL to the late James and Pearl Mae Buntin. She attended Real Life Church of God. Her love for the Lord could always be seen through her caring and giving heart. As a homemaker, Mildred devoted her life to taking care of her family. She has left a legacy for her children, grandchildren, and great-grandchildren and has touched the lives of all who crossed her path. Mildred will be dearly missed and lovingly remembered by her children, J. Delores Shumaker of Columbus, GA; Michael D. Henson (Monica) of Phenix City, AL; and Mitchell DeWayne Henson (Karen) of Columbus, GA. Mildred will also be fondly remembered by her grandchildren, Melody Shumaker, John Michael Henson, Mitchell Henson, Matthew Henson, Stephanie Henson, and great-grandchildren, Grace Henson, Hannah Henson, Levi Henson, Harper Henson, Matthew Jr. Henson, Lilly Henson, and Mikah Henson. Additionally, she will be dearly missed by her nephews and nieces, Jim Buntin, Carolyn Treadwell, Janie Ketchum, C. Joel Grant, David L. Grant, Lemuel E. Grant, Gloria Bailey, and Tim Grant. She was predeceased by her loving and dedicated husband of over 64 years, John W. Henson in 2001; son, Duane Henson; four brothers; and two sisters. A funeral service will be held at Vance Brooks Funeral Home, 4048 Macon Road, Columbus, GA on Saturday, April 13, 2019 beginning at 2:00 PM with Pastor Roger Morrison officiating. The interment will conclude at Parkhill Cemetery. The family will receive friends Friday, April 12, 2019 at Vance Brooks Funeral Home from 6:00 PM until 8:00 PM. Those so desiring to extend condolences may visit www.vancebrooksfuneralhome.net.